December 2016: Scaly Laughingthrush, Tibetan Serin and Alpine Accentor discovered in the Naga Hills, NE India. 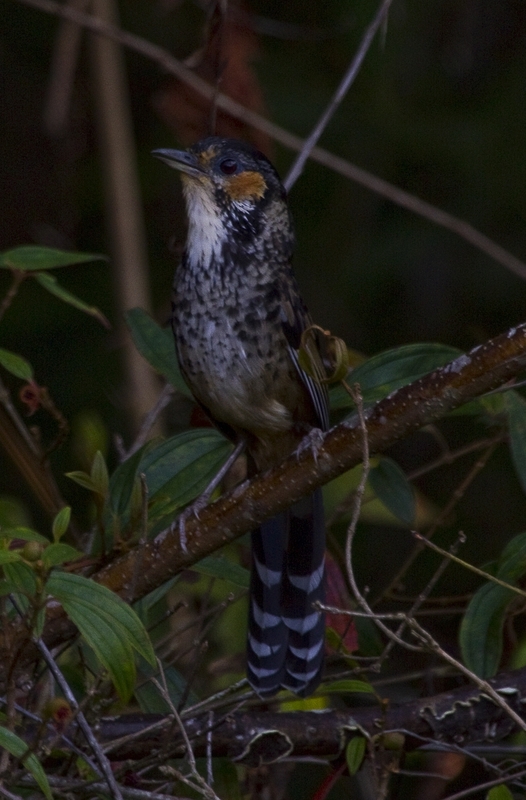 Scaly Laughingthrush is a new subspecies to science? On 12th April 2015, whilst visiting Joli Borah’s field site in the Fakim Wildlife Sanctuary — a reserve that Joli’s local research assistants told us had never previously been visited by a foreigner! — I briefly saw a laughingthrush on the path. The glimpse was of a bird with grey head, olive-brown body with feathers tipped black, yellow-olive wings and tail tipped white; enough to convince me that I’d found Scaly Laughinghthrush. 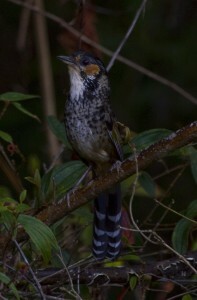 Joli noted that it couldn’t be because Scaly Laughinghthrush didn’t live in Nagaland, to which I responded “Well, it does now!” After a lot of playback, plus the very welcomed interjection of superb views of Blyth’s Tragopan, I eventually heard Scaly Laughinghthrush singing. I made a sound recording, and using playback we got superb views. Excitingly, this represented a range expansion of about 230 km. And even more excitingly, this bird was rather different to the nearest subspecies subunicolour. First, it looked a little different, with a grey not yellow iris, and appearing to have a greyer head. Second, the song in Figure (A) was noticeably different from subunicolour in (B), (C) and (D). These differences make it plausible that the Naga birds are an undescribed taxon! The next morning, walking beneath Fakim village along a stretch of alder-flanked dirt road, I found a small flock of about 12 Tibetan Serin. They made several wheeling flights from their perches in alder trees. The flock contained six beautiful males (and some drab females), with the diagnostic combination of bright yellow underparts, narrow wing-bar, supercilium extending behind the yellow-olive ear-coverts, and yellow-olive upperparts and wings. Again, this was a substantial range expansion, with the previous closest records from Namdapha National Park about 230 km to the north-east. Two new species to the Naga Hills in two days — fantastic! Given our discovery of two new species to the Naga Hills, Joli mentioned some photos she had been given by local wildlife enthusiast Tsuseki Yimchunger, which were taken from near the summit of the nearby Mount Saramati in November 2014. 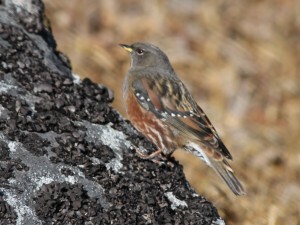 Amongst them were three photos of Alpine Accentor. Another new species to the Naga Hills, this time representing a range expansion of about 350 km from the nearest known records in the Mishmi Hills! In April 2015, Joli Borah and myself were walking the roads surrounding Pungro village, Nagaland, India, in search of Yellow-throated Laughingthrush, a beautiful but little known species that lives in the dry forests of the South Annam Hills in far eastern India. I had already set myself the target of recording its song, despite the species being unknown to sing. After a couple of days of fruitless searching, we were walking past some seeding grasses, when a small flock of 3-4 Yellow-throated Laughingthrush moved quickly and quietly through the undergrowth and out of view: a decent but frustratingly brief view. After 10 minutes of waiting, I heard an unknown song, which I recorded and played back. 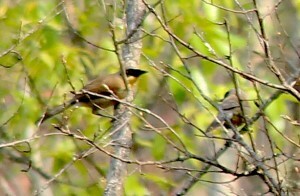 After a couple of minutes, two Yellow-throated Laughingthrushes quietly approached and started to sing from just a few metres away. 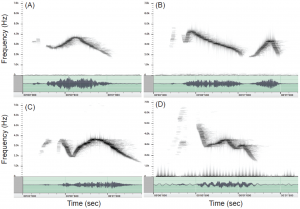 I eventually obtained several excellent audio recordings (deposited on Xeno-canto.org XC289254, XC289255, XC289256, XC289257; but access of these recordings is prohibited due to the risk of misuse by cage bird trappers). The song was beautiful, melodius, and loud. It consists of five equally spaced whistled notes lasting 1.5 seconds. Each note is 0.2 seconds in length (mainly 2-3KHz). The first and third notes are slightly tremulous and downslurred compared the second and fifth upslurred, piercing whistles with the third note being equally piercing though downslurred. The motif would best be described as brrt-peewit-peow-brrt-peewit. Awesome! 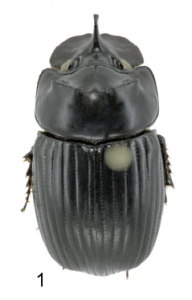 Kudos to Felicity Edwards as a new dung beetle that she discovered in June 2012 is officially described and named after her! Whilst on fieldwork as part of our Biodiversity, Agriculture and Conservation in Colombia (BACC) project in the Western Cordillera of the Colombian Andes, Felicity encountered a dung beetle that looked very different from the other species she’d been working on. It has very prominent ridges on the head for the genus Ontherus, and subsequent taxonomic studies by our collaborators Claudia Medina and Arturo González have proven it to be new to science. 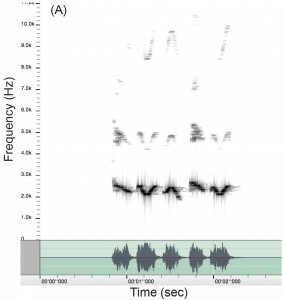 May 2010: Bar-winged Wren-babbler – a new species to Vietnam and a new sub-species to science? The dream team of Simon Mahood, Felicity Edwards and myself made a chance encounter of Bar-winged Wren-babbler as we ascended Mount Fansipan in northern Vietnam. I made sound recordings of an unknown (to us) bird song and as I re-played the sound, a small wren-babbler immediately approached. 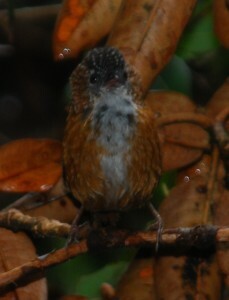 This beautiful little bird was obviously a bar-winged wren-babbler, a species previously unknown from Vietnam! 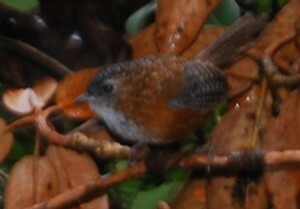 Felicity took some great photos, which confirm that this bar-winged wren-babbler shows several features that are not found on any of the other sub-species. Our bird has blackish lores, a dark crown absent of rufous colours, and dark grey cheeks that contrast strongly with the rufous ear coverts. This makes it likely to be an undescribed subspecies. Two avian discoveries on our honeymoon, awesome! May 2015, update – As I write for the new EdwardsLab website, nobody has re-found this e nigmatic wren-babbler. Five years on it thus remains a mystery, which means this likely new subspecies to science is probably (very) rare and restricted to a few dwindling patches of forest. April 2017, update – Still no news about our wren-babbler discovery. Finding this bird is extremely important to ensure we can unpick it’s conservation and taxonomic status, and ensure suitable protection is in place. This enigmatic species was only discovered in 1999 in the central Annam mountains of Vietnam and was subsequently seen by just a handful of people until the last sighting in 2002. Simon Mahood, my new wife—Felicity—and myself set out to re-find chestnut-eared laughing-thrush in April 2010. We (i.e., Simon, great job man!) identified potential forest locations using GoogleEarth and after much driving and disappointment, we eventually headed to our fourth possible location—The Mang Canh plateau. As soon as we got out of the car at dawn, I heard a beautiful song in the roadside bushes. After making some recordings of the singing bird, I used playback and to our joy (and surprise) out popped chestnut-eared laughing-thrush! In the general area we easily located at least four pairs, making this a critical area for the conservation of the species and for birders who want to see it. June 2009: Spectacled Flowerpecker – a new bird species to science in Borneo? I will never forget the moment that I asked Richard Webster what he saw today. As we drove back to Borneo Rainforest Lodge in the pouring rain, he recounted seeing a bird species that he couldn’t identify, and from his description, neither could I. Upon arriving back at BRL, I asked Richard to show me the photographs he had mentioned of the ‘mystery’ bird. My response even surprised myself: “That’s almost certainly new to science”. And so it was that we discovered ‘Spectacled Flowerpecker’ feeding on mistletoe berries high in the Bornean rainforest canopy. In fact we were lucky enough to see two individuals, one far more strikingly plumaged than the other. 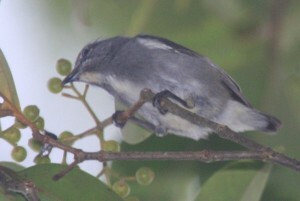 This species bears some similarities to a female black-sided flowerpecker Dicaeum monticolum, but aside from being found in lowland rather than montane rainforests there are some distinguishing features. 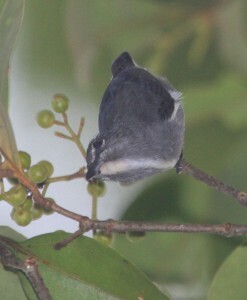 Spectacled flowerpecker is all dark grey on the upperparts and on the sides of the neck and breast, and this creates a crisp white line from the throat down the central belly. It also has a prominent, broken white eye-ring or spectacle. 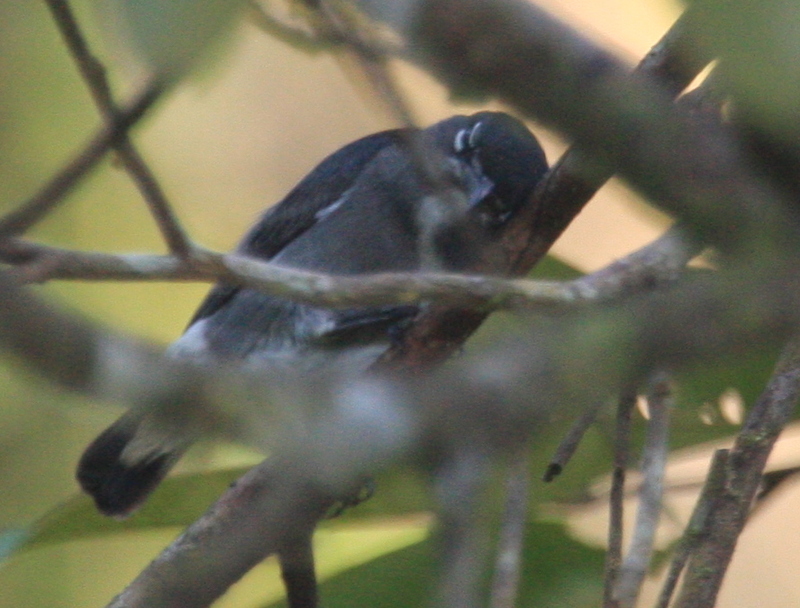 May 2015, update – There have been several ‘records’ of spectacled flowerpecker since our discovery. For me, those on Mount Kinabalu are female black-sided flowerpecker, all involving fairly poor photographs of birds that likely have a dirty wash across the upper breast and/or yellowish-green tones in the wings or upperbody. 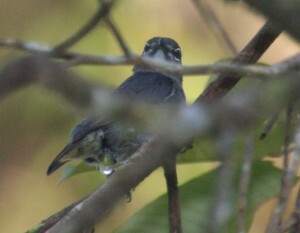 But there has been one definite record of spectacled flowerpecker. 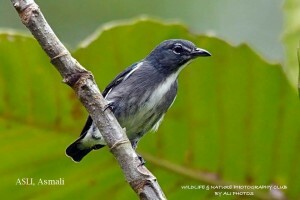 In August 2014, Asmali Asli took fantastic photographs of spectacled flowerpecker in lowland rainforest of Brunei. Get a load of that!